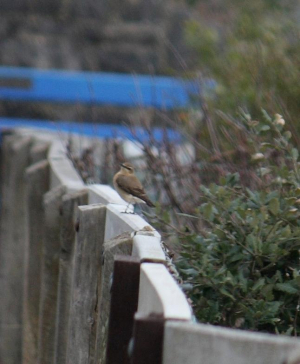 Observation - Bird - Wheatear - UK and Ireland. Description: Start to come in during March and this one was trying to feed and appeared after folks walked by. I wonder if it was using passing people to disturb insects [etc] that it feeds on. Very erect stance when on the ground. Start to come in during March and this one was trying to feed and appeared after folks walked by. I wonder if it was using passing people to disturb insects [etc] that it feeds on. Very erect stance when on the ground.